Jack's mom sent me these pictures of mason and Jack one morning this week. 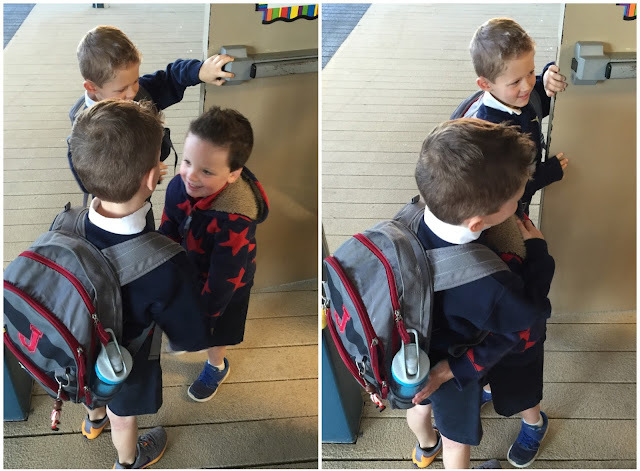 Look how sweet they are when they see each other in the morning!!! Sweet friends are my FAVORITE!!! Griffin's FAVORITE activity lately is watering the flowers. And my FAVORITE is this sweet little racerback tunic! April from Sew Chill sent it to her and I couldn't wait to get it on her. I'm giving one away today on my Instagram so be sure to head that way and check it out! And you can use the code GRIFFIN20 for 20% off your orders placed today! 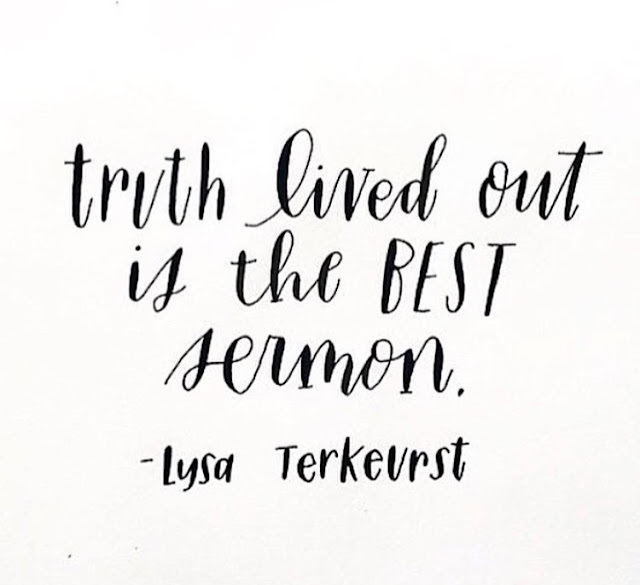 The quote below came across my Instagram feed this week and I wanted to give it all the praise hands :) It's my new FAVORITE. I've mentioned before that I subscribe to Julep - and this month's box blew it out of the water. The polishes were cute, but the beauty product is AMAZING!!! Along with the polishes they sent this cleansing stick and sponge. I followed it up with my favorite moisturizer (seriously... I've been using it exclusively for 2 years and can't imagine using anything else) and I'm not sure my face has ever felt better. The cleanser and sponge are a new FAVORITE for sure. The snapchat filters are still the boys FAVORITE thing ever and the face swap one never disappoints! We've been doing tons of outdoor cleanup and I finally got rid of our 10 year old door mat and replaced it with this beauty. Spring is here and summer is on the way and I am so excited about this kimono. The print really is amazing. And if embroidery is your thing, look at this poncho that Evys Tree just released! I mean! I ordered one on the day it came out and I can't wait for it to come in! And, for a more budget friendly option - my FAVORITE coverup from last summer is back in stock! I got so many compliments on this last summer and can't wait to break it out again this year. Another FAVORITE from this week was getting to see Shay on The Today Show! Did y'all see her???? She was PRECIOUS! And I bought this shirt to hoard for next St.Patrick's Day, but Mason has dubbed it his new FAVORITE shirt so he's been wearing it now. :) If you're looking for a cute and festive St.Patrick's Day shirt, this one is totally hoard-worthy. Last, but definitely not least, it's PROM weekend!!! And we all get to live viciously through the GORGEOUS Anna Grace!!! 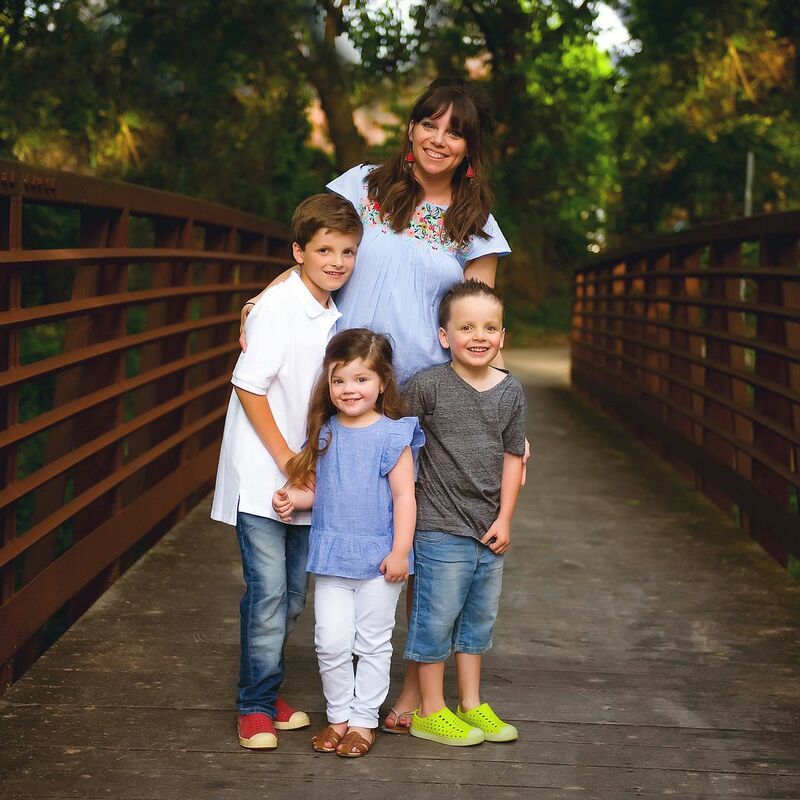 If you're new around here, I had Anna Grace in my class in the 7th and 8th grades and she started helping me out with the kids the summer that I had Griffin. I had my hands MORE than full all day every day (Mason was 2 and Luke was 5!) and she would tag along with me on errands to help hold a hand and/or stay in the car while I ran into the post office. She would play with the boys at the park (read: make sure that baby Mason didn't wander into the parking lot) while I nursed Griffin (who wanted to eat CONSTANTLY) and swam with the boys while I sat with GG in the shade since she was too young for sunscreen. 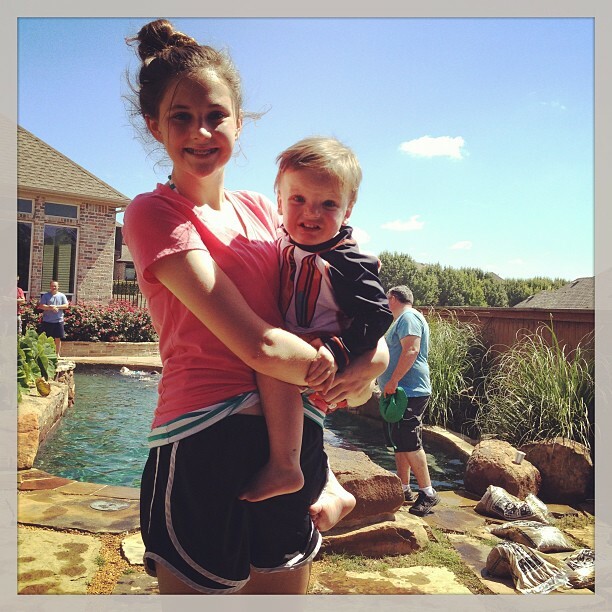 She helped me out at birthday parties and playdates and my friends all knew that if I was coming, so was Anna Grace. Pretty much, she kept me sane. And I kept her highly caffeinated with daily frappuccino runs. ... and this year we thought it would be fun for y'all to guess which dress she chose to wear this weekend! So... which one do you think she chose? Cast your vote below, and if you can't wait until Monday to find out, I MAY post a spoiler on Instagram and/or Snap Chat tomorrow. Griffin can't wait to see "my Anna Grace" dressed up like a princess! As always, thank you all so much for reading and following along! Happy Friday!!! I'm from Chicago and it snowed on our April Wedding! Not quite that heavy but there were flurries. 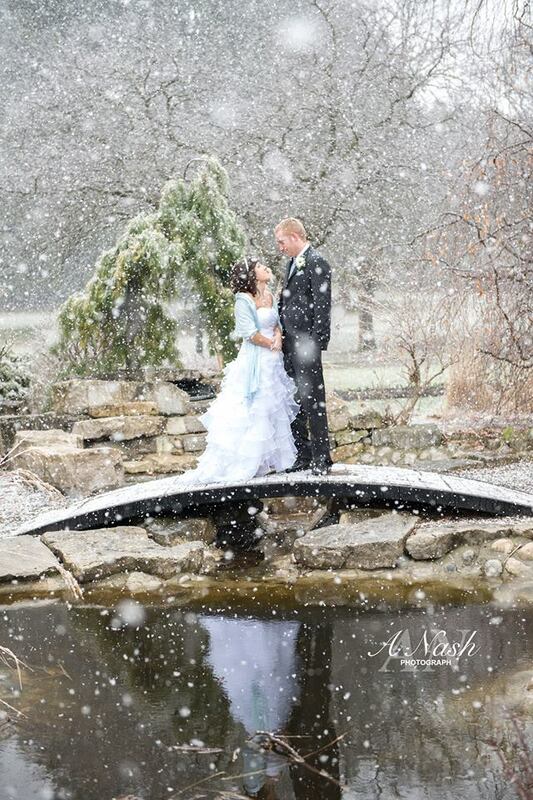 Their photos sure do look beautiful even though no one really wants snow in April! HAHA. I can't wait to see what Anna Grace chose!! My vote is the blue but she's gorgeous in all of them! She looks great in them all, but maybe the red? Each dress is more stunning than the next, but I hope she chose the floral!! Umm that picture Mason drew of Luke!! Hilarious! 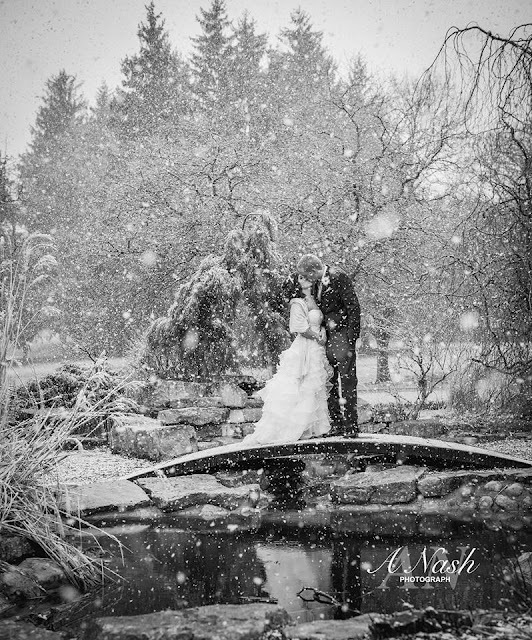 And those wedding photos are my dream, I always wanted to get married in the winter just for the hopes of pictures like that but we eventually agreed on Fall. And my vote is the emerald, although they are all gorgeous! Floral! Can't wait to see!! Oh my gosh..I really hope AG chose that trendy floral skirt and crop top! How I would love to wear something like that. That kimono is fab! Love the blue dress. Enjoy your prom, AG! Those wedding pictures are STUNNING! 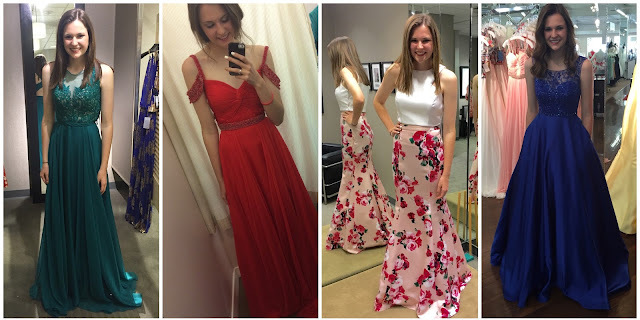 Those dresses are beautiful...prom dresses sure have come a long way! Prom dresses are SO FUN!!! Red is my first pick, then blue! Love the red and then the floral!! Anna Grace looks wonderful in all of them, but I like the blue the best! She looks gorgeous in all of them. But I'm leaning toward emerald. It's really different. Blue is pretty too! All the dresses are so pretty!! 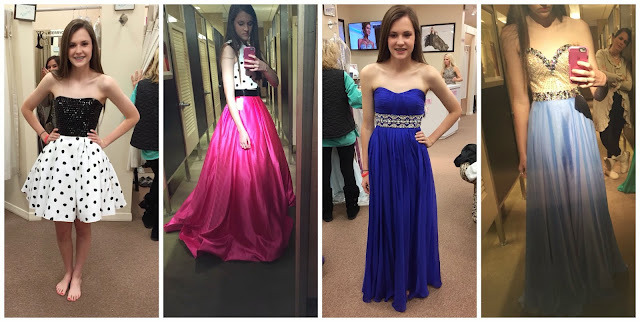 I think Anna Grace should choose one of the outside dresses- Royal Blue or Emerald Green. Griffin watering the flowers is perfection! I just adore that Albion swim suit, you are too cute! Have a happy weekend! That Anna Grace is a doll for sure. I'm going to guess she chose the floral or royal blue :) Andrea, I spy coffee in a lot of your pics and that makes me smile...I don't really know why, but it does. Looks like you like yours doctored up about the same as I do. #fistbump Have a great weekend!!! They are all good but I am guessing the floral one! So fun! Loving those photos of Griffin watering the flowers! It looks like summer down there! I vote royal blue dress! It's beautiful & classic. Ok, the green dress is Oscar worthy!!! Gorgeous. But because she is a senior, and I think I would have chosen the floral skirt number, that's what I'm going with. The floral one. The floral skirt ALL the way! I love prom time! I totally think Anna Grace picked the floral :) hope she has an awesome time at prom!! The emerald dress is gorg! She is darling in all of the dresses but I really like the floral. I tried to get my Senior daughter to get a floral one this year but she ended up choosing a gorgeous navy one. Love the floral! So young and fresh! The royal blue makes her look like a princess, and the floral is incredibly flattering on her. I also love the floral because it is so different than what the usual dresses are. So my vote goes to the floral as number one and the blue as number two. I like the red the least out of all of them. All 4 dresses are beautiful! Where is the emerald dress from? Well, by far my favorite is the blue, BUT having chaperoned prom this year with the Hubs, I know that floral two-piece numbers like the one she's wearing in the third picture were crazy popular, so that's the one I'm guessing she picked. The royal blue is stunning but the floral is so much fun! Can't wait to see her pick. well, since she is pretty much your adopted daughter, I have to think your fashion sense would rub off on her. :) I totally think if it we're you going back to prom, it would be the floral one... cute and not so 'vanilla', but she looks stunning in the blue as well! She looks beautiful in all of them! I love the floral combo. But I would vote RED for prom, it has a little something extra with the sleeves. Annagrace! I vote the gorgeous green dress or funky white and floral!! That kimono is so cute! I've been eyeing it too. Beauty question - what do you use as an undereye moisturizer? I hope she picked the green dress! She looks great in all of them but the green one is stunning! Anna Grace is a beautiful girl!! She looks fabulous in all the dresses...the emerald is my fave!!! Loved seeing Shay on Today!! Andrea, I really enjoy your blog. I find lots of inspiration and I like all your recipes. How sweet to have someone like Anna Grace to make life a little easier. She looks beautiful in all the dresses. I think she picked the blue one? Have a blessed weekend. From Spring Valley, CA. I love the 3rd from the left...so pretty!! I love reading your blog so much!! I am very close with Erika's cousin Whitney...I used to be a teacher as well. I live through you most days. Ha ha!!! Thanks for your posts. Happy Friday!!! Anna Grace would be beautiful in anything but I vote for the green or blue. I like classic, what can I say? ;) You were so blessed to have Anna Grace during your summer of little ones, every momma of many littles should have an Anna Grace:).